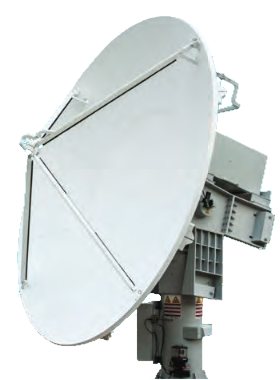 The weather radar Defender CK250 is the klystron variant of an entire C-Band radar family. It uses a symmetric parabolic reflector with diameter of typically 4.2 m. The accuracy of the positioning of the radar antenna is better than 0.05°. The radar uses either linear horizontally polarization or dual-polarity configurations. The digital receiver is fitted with an I&Q-detector and provides a sensitivity of tyically -114 dBm. Its dynamik range is about 105 dB. The radar signal processing in a commercial off-the-Shelf personal computer allows a fixed clutter suppression of ≥ 55 dB (Subclutter Visibility). A maximum of 8192 range cells can be processed within a pulse period.